Observations led by astronomers at the University of Warwick have shown that the flash from one of the biggest and brightest bangs yet recorded by astronomers comes from a massive black hole at the centre of a distant galaxy. The black hole appears to have ripped apart a star that wandered too close, creating a powerful beam of energy that crossed the 3.8 billion light years to Earth. Their research is published today 16th June, in the Journal Science, in a paper entitled "An Extremely Luminous Panchromatic Outburst from the Nucleus of a Distant Galaxy". 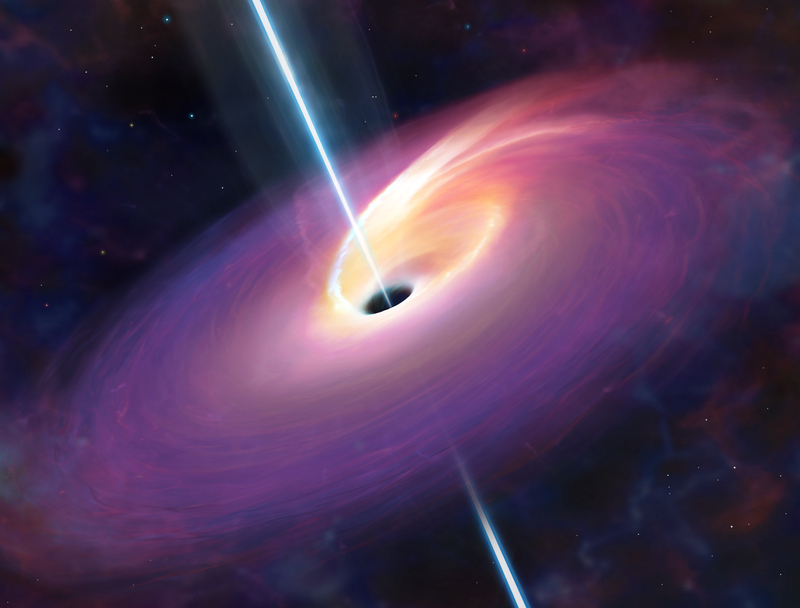 The high energy X-rays and gamma-rays persisted at an extremely bright level for weeks after the event, with bright flares arising when further chunks of the star apparently fell into the black hole, while at optical and infrared wavelengths it is as bright as a hundred billion suns. The extreme brightness of this event comes from the fact that it created a powerful beam of energy pointing a jet of light towards the Milky Way and thus concentrated into only a small fraction of the sky and which was detected at Earth 3.8 billion years after the star was ripped apart. Dr Andrew Levan of the University of Warwick, lead researcher of the international team observing this event said "Despite the power of this the cataclysmic event we still only happen to see this event because our solar system happened to be looking right down the barrel of this jet of energy". The new research paper clearly establishes that the source of this event - (known now as Swift 1644+57) is right at the heart of far away galaxy, 3.8 billion light years away, at a spot that would be in the constellation Draco. This conclusion comes from a combination of the most powerful telescopes on the ground, and in space, working in tandem to pinpoint this unique and unprecedented event. These include the Hubble Space Telescope, Chandra X-ray Observatory, Swift satellite, and the Gemini and Keck Telescopes in Hawaii. University of Warwick researcher Andrew Levan added: "The best explanation that so far fits the size, intensity, time scale, and level of fluctuation of the observed event, is that a massive black at the very centre of that galaxy has pulled in a star and ripped it apart by tidal disruption. The spinning black hole then created the two jets one of which pointed straight to earth." 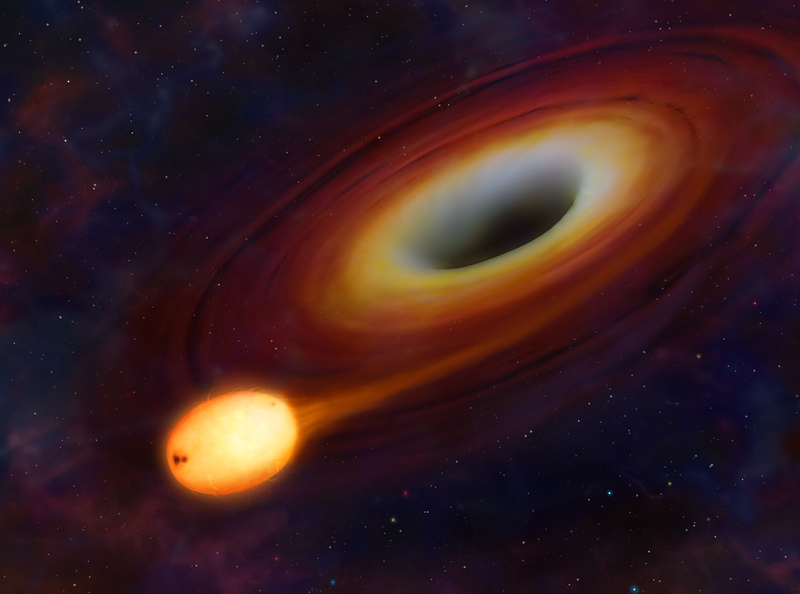 Professor Nial Tanvir, second author of the paper, based at the University of Leicester added “It is rare for stars to get very close to the black holes in the centre of galaxies, but when they do, they will always come off second best”. The researchers used an array of telescopes to study Swift 1644+57, including Hubble Space Telescope, Swift satellite, the Chandra X-ray Observatory, the Gemini Observatory and the United Kingdom Infrared Telescope to study the blast. Swift's Burst Alert Telescope first discovered the source, on March 28, when it erupted with the first in a series of X-ray blasts. 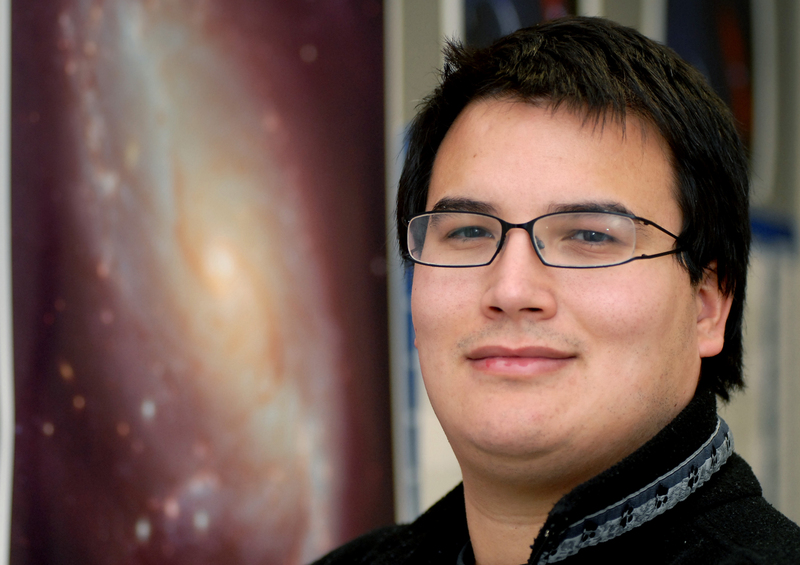 Prof Josh Bloom, of the University of California, Berkeley, leads a second paper, published simultaneously in Science in collaboration with this work, and entitled “A relativistic jetted outburst from a massive black hole fed by a tidally disrupted star”. The full list of research organizations credited in the paper is: The Department of Physics, University of Warwick, Department of Physics and Astronomy, University of Leicester, Leicester, Department of Astronomy, University of California, Space Telescope Science Institute, Dark Cosmology Centre, Niels Bohr Institute, University of Copenhagen, NASA , Universities Space Research Association, Columbia Astrophysics Lab, Columbia University, Instituto de Astrofissica de Andalucia (IAA-CSIC), Glorieta de la Astronomia , Herschel Science Operations Centre, ESAC, ESA, UCO/Lick Observatory, University of California, Institut de Radio Astronomie Millimetrique, Joint Astronomy center, University Park, Hilo, Center for Galaxy Evolution, University of California, Irvine, AIM, CEA/DSM - CNRS, Irfu/SAP, Centre de Saclay, Infrared Processing and Analysis Center, California Institute of Technology, Pasadena, CA, 91125, Centre for Astrophysics & Supercomputing, Swinburne University, Institute for the Physics and Mathematics of the Universe, University of Tokyo, Cahill Center for Astrophysics, California Institute of Technology, Centre for Astrophysics & Cosmology, Science Institute, University of Iceland, Center for Gravitation and Cosmology, University of Wisconsin-Milwaukee, Space Science Office, VP62, NASA/Marshall Space Flight Center, SLAC National Accelerator Center, Kavli Institute for Particle Astrophysics and Cosmology, Dunlap Institute for Astronomy & Astrophysics, University of Toronto, Computational Cosmology Center, Lawrence Berkeley National Laboratory, Astronomical Institute, University of Amsterdam, Netherlands Institute for Radio Astronomy, Benoziyo Center for Astrophysics, Department of Physics and Astronomy, Johns Hopkins University, Centre for Astrophysics Research, Science and Technology Research Institute, University of Hertfordshire, Isaac Newton Group of Telescopes, Santa Cruz de la Palma.